“The Hall County community deeply appreciates the important contributions Kubota Manufacturing of America continues to make to our country, our citizens and our quality of life,” said Chairman Richard Mecum as he presented a proclamation to Phil Sutton, KMA’s chief administrative officer, during Thursday’s Board of Commissioner’s meeting. 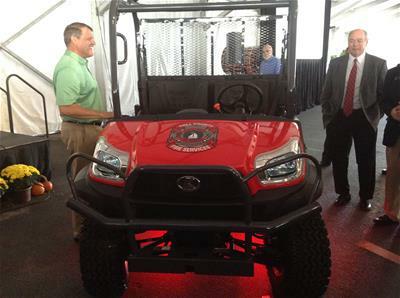 The ATV was presented to the fire department during last month’s celebration of one million units being produced at Kubota’s Gainesville plant. The proclamation also commended the manufacturing company on that milestone achievement. Hall County Fire Chief Jeff Hood said the ATV will be a crucial component to his department’s fleet as a means of access to patients in search and rescue missions or during inclement weather. He said the vehicle would also be used to move equipment, personnel and patients during these types of incidents. “It will also be utilized in events posing access issues for responders due to large crowds or events that cover a large geographical area such as events taking place at the University of North Georgia’s Oakwood campus, the Chicopee Woods Agricultural Center, Lake Lanier Islands or at large communities such as Sterling on the Lake,” he said. Hood said the ATV will also be instrumental during their summer kids’ camp and during smoke detector installations at various neighborhoods and communities throughout Hall County.